Proving once more that Barack Obama is one of the greatest people on the planet; the 44th President of the United States dressed up as Santa to surprise kids at a children’s hospital. You might think Santa would need a big red suit and some reindeer in tow in order for him to bring joy, but the Obama proved that all you really need is a red and white hat and a big smile – and a sack of presents, of course. While he may not have had Santa’s telltale white beard, the former president donned his Santa hat and brought festive cheer to the patients, staff and families at Washington’s Children’s National hospital on Wednesday (December 19). The 57-year-old was greeted with cheers as he approached the crowd before they launched into a a rendition of We Wish You A Merry Christmas, with the former POTUS as their conductor. I don’t think it could have been a more surreal experience if Santa Claus himself had turned up, fresh from the North Pole. Obama danced his way into patients’ rooms, handing out hugs and gifts to the shocked children. According to the Washington Post the first stop on his gift-delivery tour was to patients as young as four, where he handed out handed out jigsaw puzzles, Hot Wheels sets, remote-control cars and glittery nail polish. Come to residency here. This will happen. He then went on to have one-on-one meetings with some patients and their families, and recorded a video message to be played in the hospital for those he didn’t have the chance to meet. I had a chance to talk to some of the wonderful kids and their families and at a time that’s obviously tough for a lot of folks. And as the dad of two girls I can only imagine in that situation to have nurses, staff, doctors, and people who are caring for them and looking after them and listening to them, and just there for them and holding their hand. That’s the most important thing there is. What a great reminder of what the holiday spirit’s supposed to be all about. 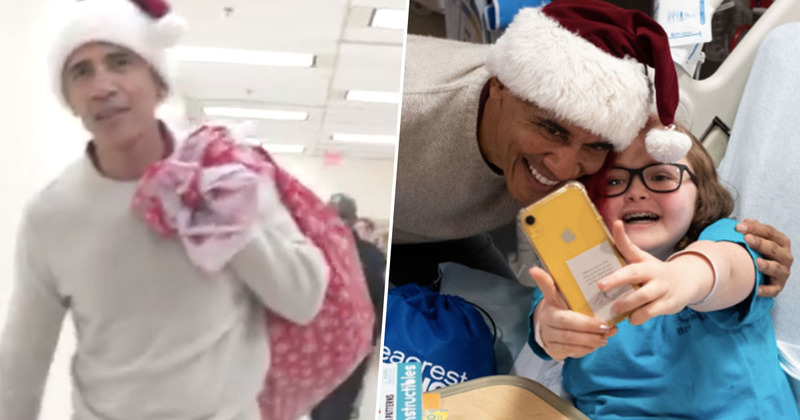 Obama later shared the hospital’s video on Twitter, acknowledging that while he might not have been the big man himself (Santa), he was grateful for the opportunity to don his hat and meet the children. I know they will be talking about it for years to come. At such a busy time of year, when no one wants to be in the hospital, his natural warmth lifted the spirits of those kids, their parents and of each staff member he met along the way. Obama is the Santa Claus we all need!